Scientists from Laser Zentrum Hannover (LZH) and Kunstoff Zentrum SKZ, Würzburg have compiled information on the emissions being released when laser processing plastics. The centre said this was crucial in guaranteeing the safety of the operators and the environment. The results are now available from the Safety Technology Group at the LZH or as part of the laser safety database on the institute’s website. EOS and MTU Aero Engines, one of Germany's leading aero engine manufacturers, have signed a joint framework agreement to develop new methods of quality assurance for metal engine components produced by additive manufacturing (AM). A new system that uses ultra short laser pulses to manufacture medical products or sensors for the automotive market has been announced as the result of a project named New Micro Ablation Technology. The project was run by the Cross Border Cluster Stimulation (GCS) which contained project partners Agora, Lunovu, and Cewac from The Netherlands, Germany, and Belgium respectively. 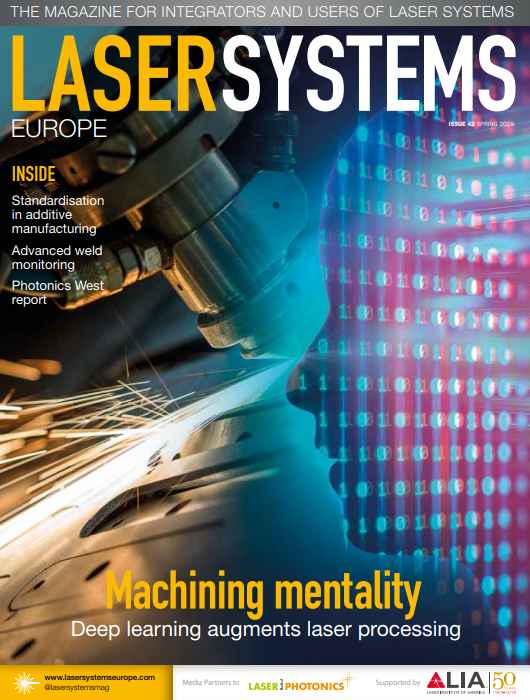 The laser expertise-sharing commission, Lashare, has called for additional partners to take part in its Laser-based Equipment Assessment (LEA). This call will offer funding of more than €1.7 million to new LEA partners, based on the rules of the seventh framework program of the European Commission. The start of the new LEAs is anticipated for 1 September 2015. Scientists at the Fraunhofer Institute for Material and Beam Technology (IWS) in Dresden, Germany have developed a laser processing tool for wire cladding complex structures. The laser processing optics, CoaxWire, was presented at EuroMold in Frankfurt from 25 to 28 November. Engineers at the Laser Zentrum Hannover (LZH) and the Leibniz Universität Hannover (LUH) are developing a process for automated, underwater laser cutting which could improve the cutting speed by a factor of seven. Once finished, the process could be used for dismantling nuclear power plants or sheet piling, and the maintenance and repair of offshore structures. A EU-funded initiative that aims to further develop an ultrafast pulsed disk laser that will have the highest speeds and output powers ever achieved, has chosen Element Six to assist the design using its cooling crystals. The laser will improve the micromachining processes used to produce transparent materials, such as the glass for smart phones.